Thanos is a major villain in the Marvel Universe. He is bent on the destruction and end of all things. He is closely associated with an item called the infinity gauntlet that grants its user near omnipotent powers. He is hunted down and opposed by the hero Drax the Destroyer. Thanos the name in Greek means either Death or Eternal. Either is an appropriate description of the character Thanos. Thanos is the biggest of the big bads that Marvel has. While other villains want to get rich, or conquer the world, Thanos wants to literally end existence in a bid to get Mistress Death to give him attention. He is super strong, intelligent, ruthless, telepathic and powerful and a master of a variety of scientific and mystical arts that make him one of toughest warriors in the Marvel Universe. To get to the powerlevel of destroying life Thanos seeks out the infinity gems which greatly augment his powers. Thanos's fellow Titans realize the threat Thanos poses to existence and so they create a hero whose sole purpose is to oppose and destroy Thanos. Thanos's father, Mentor takes the soul of a victim of Thanos and creates Drax the Destroyer. 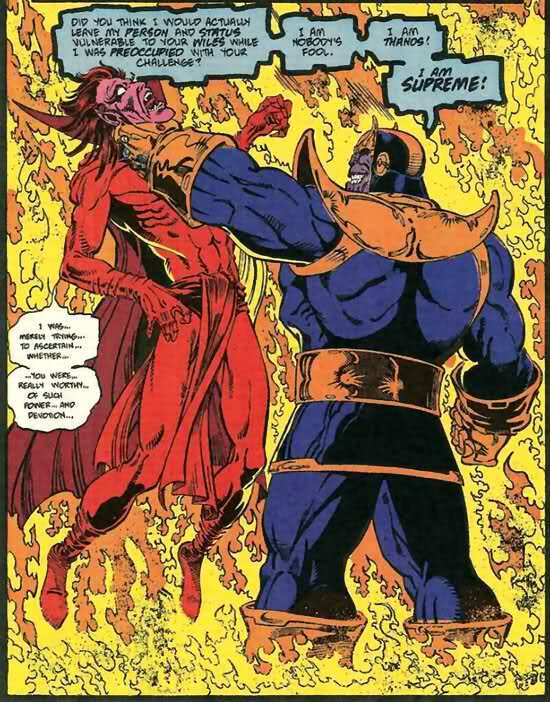 Drax is given a powerful body and desires only vengeance on Thanos. Unknown to Drax, Mentor also saved his daughter and raised her on Titan, she later emerges as the hero, Moondragon. Thanos wipes out the race known as the Zen Whoberi. He takes the last offspring of the species names her Gamora and raises her as a daughter. He is not a kind father but instead trains Gamora to be tough and ruthless. Working for her father as an assassin she gains the reputation of the most dangerous woman in the galaxy. She later betrays Thanos and becomes one of his most stalwart enemies. His search, battle and eventual getting the God like power of the infinity gauntlet were the story of a few major Marvel events. Thanos has been killed a few times, only to be brought back. During Thanos Imperative the Guardians of the Galaxy actually bring him back to life so as an avatar of Death he can face off against an evil world where there is only life. Nebula - Claims to be biological daughter in the comics (disputed by Thanos). She is an adopted daughter of Thanos in the MCU. 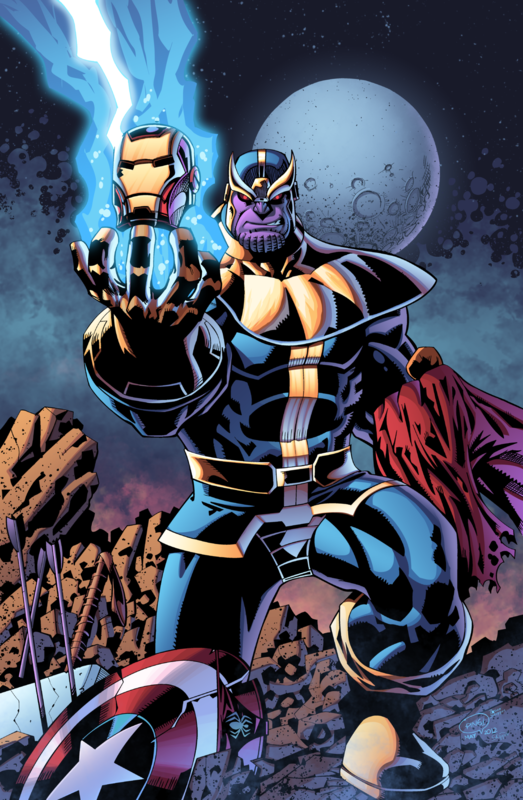 Thanos is one of the creations of comic writer Jim Starlin. Jim Starlin was taking psychology courses at the time and conceived of Drax the Destroyer and Thanos. Thanos being a villain infatuated with death and Drax being character created to destroy him. Given a chance to write for Iron Man he threw both characters into the story. Initially, Thanos was somewhat skinny, Starlin had based his design of him off of Metron one of the new gods at DC. Editor Roy Thomas looked at the design and suggested he beef up Thanos and copy the better new god Dark Siege. For this reason Thanos and Darkseid are both similar looking and serve a similar role as the super bad and power villain. The similarity is pretty well known. During one universe cross over event the similarity is even referenced with Darkseid finds the infinity gauntlet. Lucky for everyone he is unable to use it. Apparently, its powers are isolated to the Marvel Universe, which was good from everyone. Thanos's power level is very high. He can pretty take on any character in the Marvel Universe and with the infinity gauntlets has literally taken on every character in the universe. Thanos is played in the Marvel Cinematic films by actor Josh Brolin. 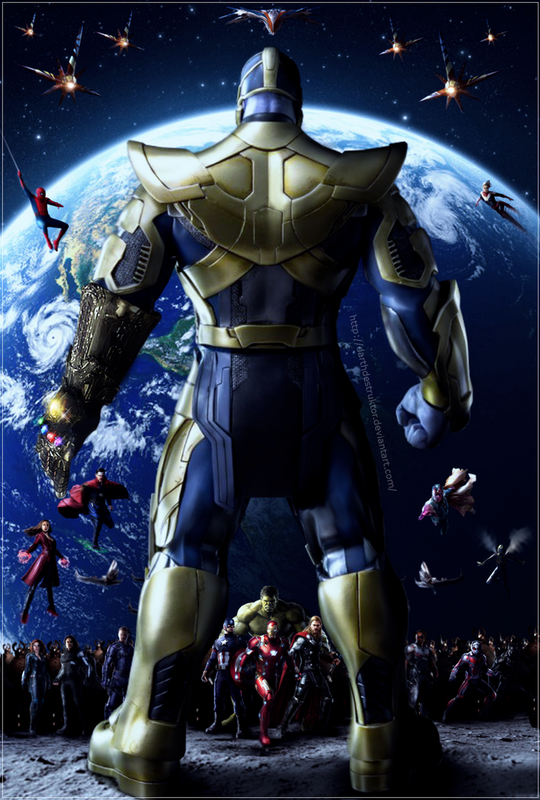 Thanos has appeared in the films Avengers, Guardians of the Galaxy, Avengers 2 Age of Ultron, Avengers 3 Infinity War. He will make another appearance in Avengers 4. 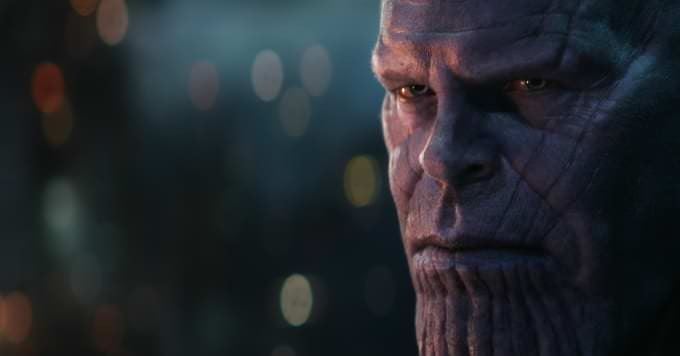 Thanos is obessed with an idea that half of the life in the universe must die so that the other half can live. He feels strongly that if half do not die then all will die. To accomplish this he seeks out God like powers that are provided through the Infinity Stones. Each stone grants the holder immense powers control over time, space, etc. When combined together they give user the ability to complete his goal of wiping out half of life. Thanos in the films has a variety of armies at his disposal including the Chitauri. He also utilisizes a super powered elite group called the Dark Order to accomplish tasks. He has two daughters he has raised as part of his Children in Gamora and Nebula also are used as agents until they rebel against him. Avengers 1 film: He made a brief appearance in the after credit scene of the Avengers. Thanos provided Loki with the Chitauri Scepter with Mind Infinity Gem attached. It was also one of his armies that invaded Earth at the behest of Loki. Did Loki have the Mind Infinity Gem in the Avengers? 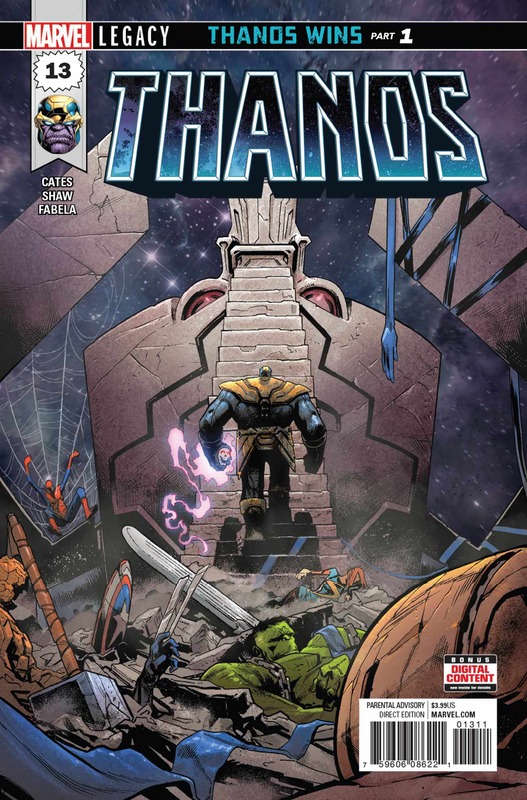 Guardians of the Galaxy Prelude Comic: In the comic Marvel Prelude #1 we see a Thanos more focused on Strength and ridding oneself of weakness than a focus on Death. Guardians of the Galaxy film: Thanos appears as a major cosmic force in Guardians of the Galaxy however he is not the primary villain of the film Ronan is. Thanos is using Ronan to hunt for one of the Infinity Stones however Ronan betrays him. Both Nebula and Gamora the rebellious daughters of Thanos are introduced in this film as well. Avengers 2 Age of Ultron: There are few hints of Thanos imbedded into the film notably a dream sequence of Tony Stark that hints at the end and deaths of the Avengers. Thanos appears at the end credits of the film and he pulls out the Guantlet and says sometimes you need to do things yourself. This seems to indicate that he believe the mind stone's power would destroy the Avengers through something like Ultron. Avengers 3: Infinity War. Thanos is the primary villain of this series. He and his agents attempt to acquire all of the Infinity Stones. In the end he is successful and snaps his fingers wiping out half of the life in the universe. Celebrate your favorite Marvel bad guys in Marvel Villains Week!